Home/Posts/Uncategorized/New Year New Game Ideas! New Year New Game Ideas! It’s a new year and it’s time to spice up services with new games. I think everyone can agree, coming up with new types of games can get tough. This week I stumbled across Late Night With Jimmy Fallon”‘s blog. If you have ever watched the late night show, they play some pretty sweet games with celebrities on the show. Now even though you won’t have the celebrities, most of the games on his blog would make some fun, easy and exciting new games for your youth ministry, so I thought I would share. Each game comes with a video of how they set it and how it’s supposed to go. I’ll admit it, I laughed at most of these. There are some games that you won’t be able to play because of the content, but I’m sure you can adjust it to make it work for students. If you want to check out the blog, click HERE, but below are some of the descriptions of the games. Water War – Jimmy and Jason square off in thee traditional card game War, but the loser of each round is doused with water. Pinada Kirate – Karate Pinata is back! 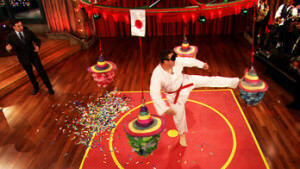 Jimmy welcomes three audience members who enter the fiesta ring to blindly kick rotating pinatas. So go on and explore and go have fun with your students! And, if you didn’t know, DYM has a ton of great games to download on this site! Click HERE to check them out!